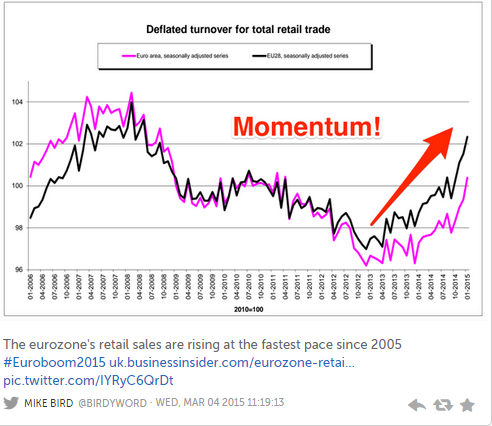 What Business Insider’s Mike Bird somewhat ironically calls #euroboom2015 seems to be well and truly with us. This is just the issue. There is such a phenomenon as getting too much of a good thing. If you talk up the successes of QE to the nth degree then suddenly it seems its continuation is hardly going to be necessary, since all the good work has already been done. Naturally Mr Draghi is anxious to avoid this conclusion, even if some of his opponents on the ECB’s Governing Council are not. For the moment the critics are silent, since the possible Grexit eventuality means that tolerating QE is for the time being expedient to protect the rest of the periphery from possible contagion. In fact most of Mr Draghi’s critics are also among those who are most favorable to a Grexit outcome. Markets are evidently growing increasingly nervous at the lack of a resolution in the EU Institutions/Greece stand-off, but eventually – match point style – the ball will come down on one side of the other of the net. Then we will see that the situation we are in now – which appeared to be so peaceful and full of joy – is actually a very unstable, and very temporary, equilibrium. 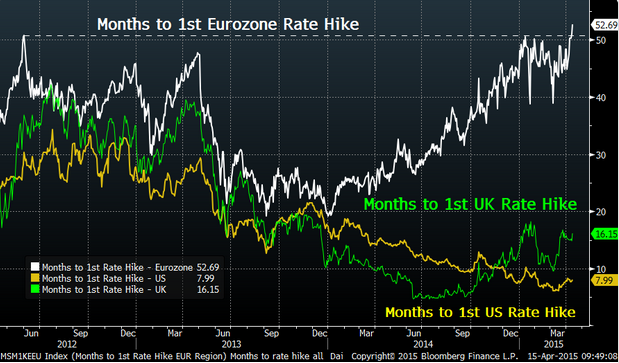 The initial ECB QE trade is nearly done, and markets are looking for another narrative. Either one of two things can happen: Greece can leave, or it can stay. In the first case QE becomes permanent, since countries like Portugal and Italy also have unsustainable debt burdens, and taking QE off would simply lead to market testing of one or other. In the second case, Greece stays in, we will go straight into a taper debate, since the opponents will become more vocal, and the data – as I will explain below – will support them. In this case market reaction is going to be very hard to anticipate. Does The Euro Area Have a Deflation Problem, Or Doesn’t It? As described in my previous post on this topic, the ECB is committed to a 60 billion Euro a month bond purchasing proposal, which is conditional on achieving a sustained increase in the inflation outlook towards a 2% inflation rate, in the medium term. Period. There is no other objective – not growth, nor unemployment – since these are not in the ECB mandate. Naturally, the fact that many people – including several country representatives on the ECB governing council – have never really accepted there was a deflation risk, rather than just a short term dip in headline inflation provoked by a drop in energy prices, is bound to lead to increasing speculation about the immovability of the September 2016 end-date as inflation and inflation expectations start to rebound. Perhaps its worth pointing out that examining the potential for short term “taper tantrums” in no way precludes the possibility that whatever happens to the predictable attempts to stop QE early the ECB may in fact eventually find itself caught in the jaws of QE for many years to come. The reason for this is simple: the Euro Area may be suffering from secular stagnation, a possibility the vast majority of ECB watchers and Governing Council members still exclude. In the short term, however, the legal basis of the current programme is more tenuous than many imagine, since, as will be explained below, it exclusively hangs on attempting to comply with the price stability mandate. It is also important to understand that the ECB is not the Bank of Japan, not only because it rests on a different institutional base, but because it hasn’t been fighting deflation for over 15 years. If we look back at the history of the BoJ there had been numerous false starts before Governor Kuroda was actually given the authority to go as far as it took, and damn the consequences. Mario Draghi – despite his “whatever it takes” promise – still does not have this kind of political backing, as was evident during the long running debate about whether he would be able to do QE at all. So it is the opinion of this author that the likelihood of a Governing Council which is only half convinced that it is necessary to do what it is actually doing, and which has an inflation- and not a deflation-bias mindset is more than likely to err on the side of a false start at some point in time. The question, really, is when. Naturally, and before going any further, it is worth making one more thing clear: if Grexit were to happen, all QE taper bets would be off, since in the aftermath QE would surely be maintained more or less indefinitely, but in that case Mario Draghi which be able to refer to a Euro existential survival argument which he can’t use otherwise. So Just Who Has Been Provoking the Tapering Debate? ECB Executive Board member Yves Mersch was also out before the last meeting informing Germany’s Boersen-Zeitung newspaper that, in his opinion, the bank would be free to adjust its programme if prices moved faster than expected towards its inflation goal. “If we were to see that this process brings us to our goal earlier, then we are naturally not so tied to our decisions that we could not adjust things,” he said. This flexibility would apply either way: “In neither direction are we resistant to reality,” he told the paper. So when Mario Draghi told journalists last Wednesday that he was “quite surprised…by the attention that a possible early exit of the programme is receiving, when we’ve been in this programme only a month,” it’s not clear who he was referring to, bloggers like me, or members of his own board who have been busying themselves encouraging speculation in the press. A lot of attention has been diverted away from the (possibly tiresome for many) details of what actually went on at the board meeting by the confetti incident, but the ECB President did have to face numerous questions during the presser related to the tapering issue. An outcome hich really, at least on grounds of clarity, is not that surprising. Many of those present were curious to learn, not whether or not tapering was coming at the June meeting – which obviously it isn’t – but about what exactly the criteria are for assessing when such a scenario might arise. For those investors currently buying bonds quoted at interest rates below zero you could consider that the issue is one of some importance. Curiously, in answering one of these questions Mr Draghi referred to a discussion that, he explained, had taken place during the board meeting (now we await minutes to see more of the substance). One of his colleagues apparently is given to running marathons, and had suggested the current tapering concerns were “like asking yourself, after 1 km, am I going to finish this marathon.” He did not, however, report on how Messrs Mersch, Jazbec, Linde et al responded to the comparison. But then wording – “When carrying out its assessment, the Governing Council will follow its monetary policy strategy and concentrate on trends in inflation, looking through unexpected outcomes in measured inflation in either direction if judged to be transient and to have no implication for the medium-term outlook for price stability” – has been added. So we are dealing with trends, not transient fluctuations. Fine. Did anyone ever think otherwise? At this point we really do need the linguistic philosophers. Maybe we do have a better idea what the ECB president means by a “powerful signal”, but I personally have to admit to not being very clear about how exactly “intended” is meant to from “target”, Target is something you can aim for but miss. You can intend to achieve a target but still miss it, and you can intend to arrive on time but in fact turn up late. If there was no tapering possibility surely the auxiliary verb will would have been enough, “the programme will continue till at least September 2012.” That way there would have been no doubt, or room for speculation. That’s the form of words the Bank of Japan Governor Haruhiko Kuroda used, so if the ECB President isn’t using it there must be a reason. What we are left with, then, is the idea that it is the intention of the ECB to continue purchases until September 2016, but in fact that intention may be modified, in either direction, depending on something else. It’s not the same, for example, as promising to continue the purchases till September 2016. Cutting through all the long grass here, I think we can safely assume that what Mr Draghi was trying to tell us was that it is the ECB’s intention to carry out bond purchases for as long as, but only for as long as, sustained medium term expectations for inflation are not “below, but close to, 2%”, and that the September 2016 date is for orientation purposes only. I really don’t think there is any room for doubt here: once medium term expectations are perceived to sustainably reach this level, bond purchases will start to be wound down, whether that date be before of after September 2012. And what does “medium term” mean? Well, basically this is easier, it means 2 years forward. So currently we are talking about expectations for 2017. Obviously in September 2016 we will be talking about mid 2018, and so on. And as I discussed in my last post on this topic, the main mechanism for inducing inflation here is the exchange rate drop, and even though Mario Draghi wouldn’t dream of mentioning an exchange rate target, fulfilling the inflation objective (not target) in 2017 implies a fall in Euro/Dollar to $1.04. Once the Euro starts to fall below that level the risk rises that inflation may go above target over the forecast horizon, and I’m sure Jens Weidemann will be there reminding him of that, all the way through. So Why All the Fuss About Such a Byzantine Issue? Looking beyond that, there may in fact be one or two more immediate reasons. 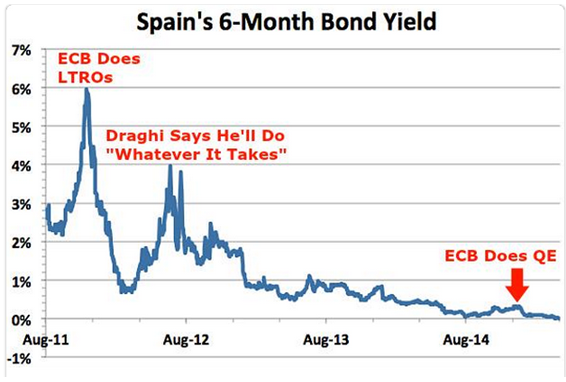 Just as a starter Spain’s first negative bond yield arrived last week. Now I know the country’s economy has made great strides in recent months, but is it really so much improved that investors should be willing to pay money to have the privilege of lending to the government, which just by-the-by had the EU’s highest fiscal deficit in 2014, and the second highest unemployment rate? 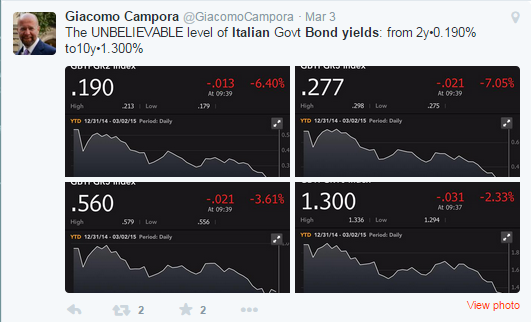 And Italian bond yields aren’t far behind. 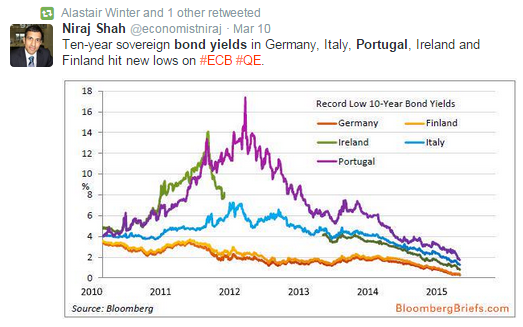 The real question we should be asking ourselves is if QE were to end, what would happen to these – and Portuguese – yields? They are all ridiculously low in relation to the level of country-specific risk in each case. At the moment they are being held at these levels by the ECB purchases programme. But if the termination of those purchases comes in sight, how will financial markets react? Eventual QE possibilities have been being built in steadily since the “whatever it takes” speech. As a result in the enthusiasm which preceded QE markets have been paying very little attention to “details” like deficit levels, etc. But what happens when you take that QE support away? When the consensus trade becomes a different one? So the issue of how long the programme will last is far from being an academic one. Mario Draghi would never admit it, but his policy – as well as that of the Bank of Japan – is having an increasing impact on the freedom of movement of the US Federal Reserve. Monetary policy divergence is the main driver of lower Euro/USD and increasingly negative bund yields. 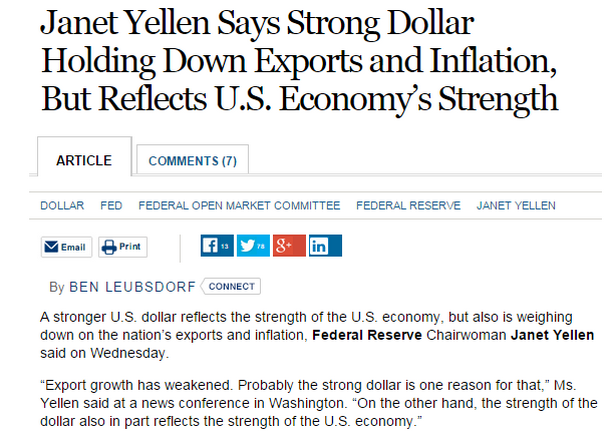 This is effectively crimping Janet Yellen’s discourse space. 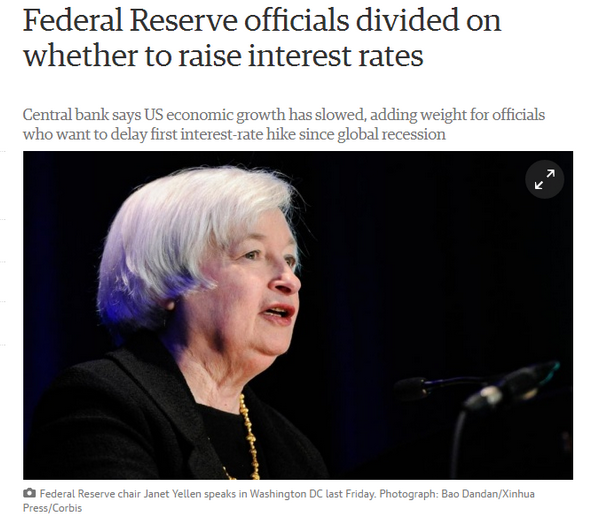 An early end to ECB QE would surely make the Fed’s job a lot easier. The Fed is perceived by markets as being forced to postpone its first interest rate rise in this cycle. One reason for his is the weaker economic growth in the US, which is partly affected by the trade performance, but the higher dollar also makes US inflation weaker, thus undermining one of the principal justifications for raising. If Janet Yellen does move towards a rate rise, and Draghi maintains a strongly “doveish” stance about insisting on September 2016, then that combination looks guaranteed to send the Euro right down to parity and below. But this, in the process, will raise the medium term inflation outlook, while probably at the same time sending German bunds ever deeper into negative territory. This could effectively force the ECB into tapering, even if the effect might well turn out to be muted in the longer run. As Mr Draghi said, it is illegal for him not to comply with his mandate. In introducing QE this argument worked in his favor, but the point could come where it works against him. Continuing with QE could become illegal, and I don’t doubt there will be no shortage of people in Germany only waiting to point this out, in court if need be. 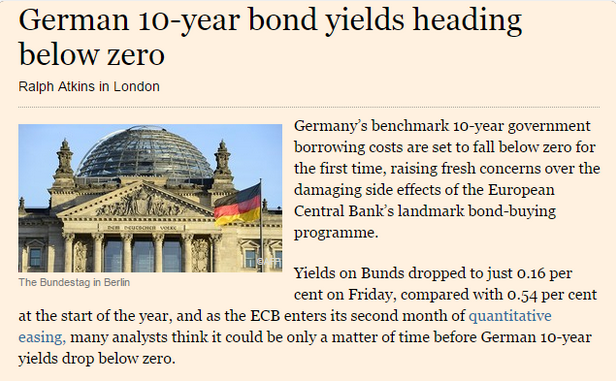 The Possible Shortage of German Bunds. The run in to ECB QE saw a massive reduction in bond yields across the Euro Area as investors steadily “priced in” the effect of a long anticipated policy move. That is one of the reasons why most of the impact of QE is seen before its actual implementation (as also happened in Japan) and is what leads to the “semi euphoria” surrounding the initial surge in economic activity. It is also part of the explanation about why the tapering debate takes off so quickly. The main thing – except Grexit – that could counter this would be signs the policy wasn’t working which produced speculation the central bank would do more (again as seen in Japan). But in 2015 that looks unlikely. Portuguese securities have seen the biggest fall, dropping from a 10 year yield of around 7% in mid 2013 to around 2% currently. Portugal’s 10-year bond yield dropped nine basis points on March 5 (the day the purchases started), to 1.79 percent, while Germany’s fell four basis points to 0.35 percent. By the start of April twenty-eight percent of German bonds within the two- to thirty-year range had yields below the ECB’s minus 0.2 percent deposit rate, according to Moody’s Investors Service, making them ineligible for the QE program. This share was 5 percent when the ECB announced the buying programme in January. Yet even while saying this, as the WSJ’s Emese Barthra points out, the bank actually increased the number of European institutions eligible for bond purchases (you can find the list here, newly added institutions in bold). The ECB programme includes 12% of purchases of non sovereign bonds issued by a variety of European institutions, and as an ECB official official was quick to point out expansion of the initial list was always planned, but still, the timing is curious. Mr Draghi said the bank would not be lowering its deposit rate (which would have made possible the purchase of bunds with a less than minus 0.2% yield), but the bank could change the structure of purchases to increase the percentage of institutional purchases if things eventually got difficult. Finally, one of the issues which arises in the context of QE programmes is that there is a risk of fueling bubbles elsewhere, outside the government bond sector, and outside the program countries. One of the main mechanisms through which such programs work is via the so-called “portfolio effect”. Essentially the central bank forces down interest rates on the long (10yr+) end of government bonds to encourage existing holders to sell (thus realizing capital gains) and move into other, riskier, assets. The composition of the investment portfolios of banks, insurance companies, pension funds etc starts to change making credit more available either across the domestic economy, or abroad. In the latter case the move helps the bank achieve its objectives by weakening the currency (promoting exports) and generating inflation via more expensive imports. 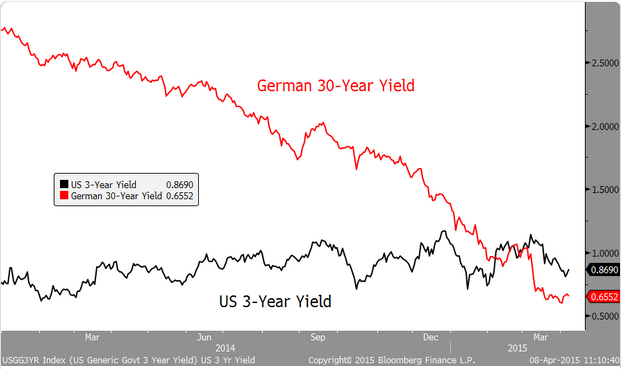 This is what is steadily happening in one market after another, as bond yields gradually fall below zero. Germany is obviously becoming an acute case with all debt out to nine years now negative, and even the ten year bond looks all set to join the rest. Not everyone would agree with that. Pension funds in Germany are especially sensitive on the question. One popular asset class being used as an alternative, according to Investment Week, is property. “European property has become a popular asset class as people move up the risk curve,” Alban Lhonneur, manager at F and C Real Estate Securities, told them in a recent interview. Christopher Iggo, senior manager at Axa Investment Managers put the problem more forcefully. “It is a tax on pension funds because they cannot get the required return,”he told the Financial Times. So everyone becomes more risk prone, and starts to buy more problematic assets. At the bottom of these concerns are worries about whether or not QE does have any lasting impact on real economy dynamics. The UK and US cases appear to suggest that it might. But this depends on what the problem you are addressing is. QE certainly seems to work in cases of financial instability following a global crisis, ie it can protect against the effects of shocks, but it seems to work less well in longer term, deeper problems like the one from which the Euro Area and Japan are suffering. Thus the balance sheet of pluses and minuses will be different, especially if the underlying issue really is secular stagnation. needed to achieve that “moderate growth” outcome this time round? Perhaps in Europe and Japan we are about to find out. This entry was posted in A Fistful Of Euros, Economics, Economics: Currencies by Edward Hugh. Bookmark the permalink.